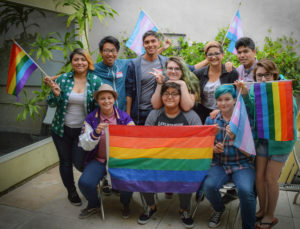 The Lunch Bunch, Every second Saturday of the month from 11am to 2pm, you can come hang out at the San Diego Pride office with other LGBTQ+ junior high- and high school-aged youth! Lunch and beverages are free thanks to San Diego Ambassadors of The Trevor Project, so no need to pack a lunch or bring money. Just come hang out, meet other queer kids, make friends and have a great time! Get connected to other youth-serving programs and help Pride plan other youth-centered events and this year’s Youth Zone at Pride! Teachers, parents and youth! Help spread the word by downloading our “Lunch Bunch” flyer and passing it out to someone you know that might want to go. Download here.